Algorithmic trading, algo trading, automated trading, or black box trading is a technological advancement in the stock market. It is a programed process that runs on a computer, which follows a specific set of instructions (an algorithm) for placing a trade in order to generate profits at a speed and frequency that is impossible for a human trader. Algorithmic trading is gaining significant traction, which is useful for financial market and accepted by various countries such as the U.S., India, the U.K., and South Korea. Accuracy, exceptional speed and liquidity are the unique features of algorithmic trading, which will result in exponential growth of algorithmic trading market in the near future. Global algorithmic trading market is expected to witness significant growth during the forecast period (2018-2026). This is attributed to increasing adoption of cloud-based solutions, services, and cloud computing for algorithmic trading. Traders use the cloud services to check backtest, trading strategies, and run-time series analysis with executing trade. Traders choose cloud computing as it is capital intensive to build one’s own data centers for services such as data storage, backup and recovery, data management and networking traders. Therefore, it is easier to rent space over cloud rather than developing software/hardware infrastructure. According to Coherent Market Insights, the cloud computing market is expected to grow from US$ 58 billion in 2013, to US$ 191 billion by 2020, and professional cloud services market is expected to grow from US$ 15.36 billion in 2017, to US$ 41.59 billion by 2023. Hence, increasing adoption of cloud based services is expected to drive growth of the algorithmic trading market. Growing demand for AI-based services in financial sector drives growth of the algorithmic trading market. In algorithmic trading, AI helps to adopt market conditions, learn from experiences, and accordingly make trade decisions. Trading houses such as Blackrock, Renaissance Technologies, Two Sigma, and others, are using AI for selecting stocks. According to Coherent Market Insights, in 2018, about 37% of the financial institutions in India invested in artificial intelligence-focused technologies and around 68 % plan to adopt it in the near future. Therefore, increasing adoption of AI in financial sector is expected to drive growth of the algorithmic trading market over the forecast period. Moreover, increasing adoption of non-equity trading algorithms by institutional asset managers is another factor driving growth of the algorithmic trading market. On the basis of region, algorithmic trading market is segmented into North America, Europe, Asia Pacific, Latin America, Middle East, and Africa. 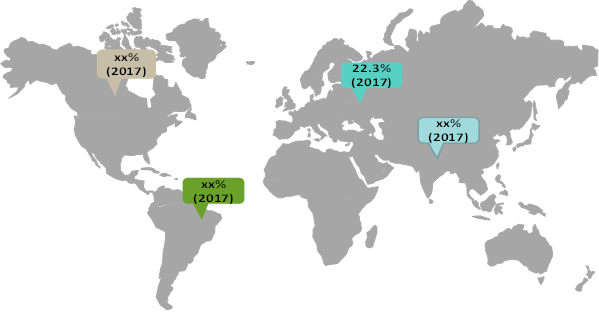 North America algorithmic trading market contributed the largest market share in 2018. This is due to strong technological advancements and considerable application of algorithm trading among various end-users such as banks and financial institutions, across the region. According to SelectUSA, financial markets in the U.S. are the largest and most liquid in the world. In 2017, finance and insurance sector represented 7.5% (or US$ 1.45 trillion) of U.S. gross domestic product. For instance, in April 2018, BMO Capital Markets, the investment and corporate banking arm of BMO Financial Group, announced multi-year strategic partnership with Clearpool Group, a provider of advanced electronic trading software. Under this agreement, Clearpool will provide BMO with a fully customizable algorithmic management system (AMS) infrastructure to execute Canada equities for BMO's institutional clients. Moreover, in April 2016, the U.S. Securities and Exchange Commission (SEC) approved a rule proposed by the Financial Industry Regulatory Authority (FINRA) to reduce market manipulation that requires algorithmic trading developers to register as security traders. Some of the key players operating in the market include AlgoTrader GmbH, Trading Technologies International, Inc., Tethys Technology, Inc., Tower Research Capital LLC, Lime Brokerage LLC, InfoReach, Inc., FlexTrade Systems, Inc., Hudson River Trading LLC, Citadel LLC, and Virtu Financial. Algorithmic trading, also termed as algo trading, is a method that uses computer programs and software to execute various trades with minimal human intervention. It has gained significant traction in the financial industry as it allows investment managers to be in full control of their trading process with reduced transactional costs. High frequency trading (HFT), which involves selling and buying of shares (mostly in thousands) in seconds, is one of the most popular method in algo trading. The computer-programmed trading follows a defined set of rules for trading. The technology incorporates human as well as artificial intelligence, which enables higher accuracy and reliability among users. Rising number of financial organizations and investors opting for automation of trading processes is one of the major factor driving scale adoption of algo trading in the market. For instance, in April 2018, SEBI announced plans for new norms that will make algorithmic trading more accessible for investors. According to Coherent Market Insights, in year 2018, in India, algorithmic trading gained popularity among institutional investors for investment banks, hedge funds, and accounts for 35-40% of the turnover on the exchange. Moreover, emerging economies such as India, South Korea, and others, who have expanded its reach on international platforms with diverse distribution and portfolio has increased demand for algo trading process. *Browse 60 market data tables and 40 figures on "Algorithmic Trading Market - Global forecast to 2026”.